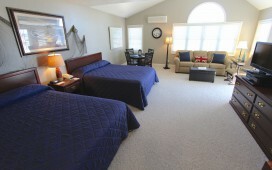 Staterooms are one large room with either 1 King bed, 1 Queen bed, or 2 Queen beds and a private bathroom. They include a sitting area, small refrigerator, microwave, and coffee maker. Sit out on your private patio or balcony and enjoy the courtyard and marina views. Like a standard Stateroom, our Deluxe & Premier Staterooms also have an optional kitchenette, whirlpool, or fireplace. They can comfortably sleep 2 to 4 people. See more Deluxe Stateroom details. 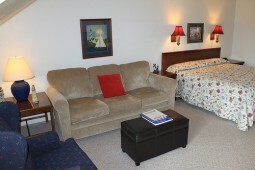 Junior Suites have a private bedroom with 1 King bed, a private bathroom and a separate living area with a kitchenette. Take in the beautiful harbor views from a private patio or balcony. See more Junior Suite details. 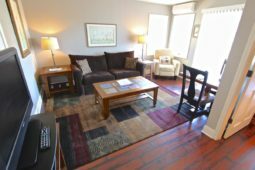 Our One Bedroom Suites feature a private bedroom, a private bathroom, a separate living room with a gas fireplace and pull-out sofa, and a full kitchen. Each suite has a private patio or balcony, and harbor or courtyard views. See more One Bedroom Suite details. Our Two Bedroom Suites have either lofted or private bedrooms and one or two private bathrooms. 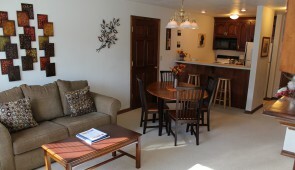 All include a separate living room with a gas fireplace and a full kitchen. Relax on a private patio, balcony or screened porch and enjoy the wooded and water views! 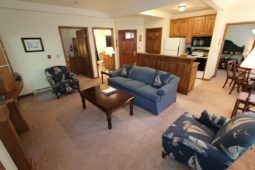 See more Two Bedroom Suite details.